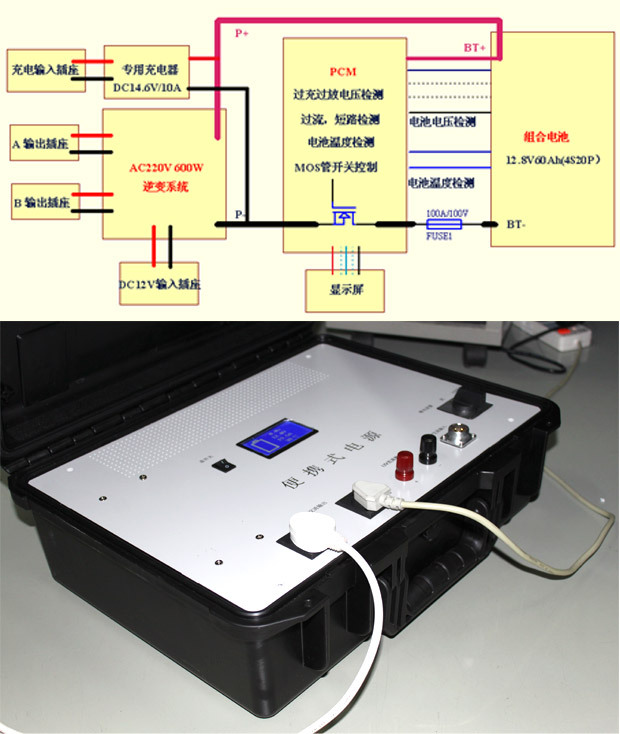 Foreword: Industrial portable emergency power can not only be applied to outdoor emergency communication equipment Power Supply, but also mobile radio waves exploring the system power supply and other field equipment emergency power. This kind of system consists of Lithium batteries, BMS (Battery Management System), Battery status display screen, Inverter system, the charger, powered by AC/220V alternating current of car power generation and battery-powered, and equipped with military grade OuterBox to avoid Earthquake or falling down. Using high-quality iron phosphate lithium batteries, Industrial inverter module, BMS management system based on Imported chips, Lithium battery has perfect multiple protections, detect single string voltage of battery accurately, balances management effectively, and manages multiple strings lithium batteries intelligently with the features of reliability and high intelligence. According to product specifications and customer requirements, design the intelligent lithium battery to match the host engine, integrate the high-security, high-efficiency automatic equalization management, intelligent battery management, outstanding recycle life and other functions the solution. A.Protection Board (PCM): According to the chemical properties of lithium-iron phosphate battery, targeted to design the protection circuit, in addition to overcharge, over discharge, over current, short circuit protection and over-temperature protection, the protection board design also have to provide the batteries’ power detection and equalization. D.Battery cells: Use the LARGE26650/3.2V/3000mAh lithium iron phosphate battery cells, with high consistency, high safety and high cycle life up to 2000 times. The parameter of the entire set of battery is 12.8V/60Ah. I. The method that battery pack uses plastic brackets to isolate and fix batteries is more conducive to safe use and battery cooling.